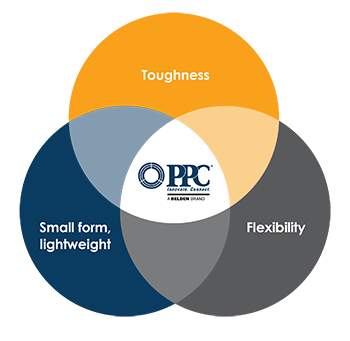 PPC is a pioneering fiber optic cable manufacturer and protected fiber solutions provider whose aim is to reduce the cost of fiber cable deployment across multiple markets, from automotive and aerospace to data centers and telcos. Fiber optics sit at the heart of modern technology and the Internet age. 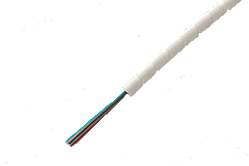 But, for all its advancement, fiber remains a delicate and highly specialized material. It is easily damaged and requires specialist skills during installation and usage. For these reasons, the deployment of fiber often carries with it greater commercial risks and higher costs versus less attractive options. In many instances, these risks force operators and engineers to think twice before using fiber cable in their products or projects. 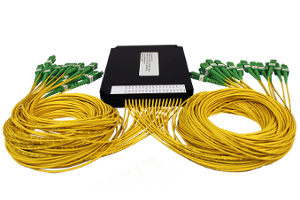 We believe that the deployment of fiber cable should be easy and cost-effective. In order to achieve this, fiber needs to withstand the rigors of installation and use. So we develop revolutionary fiber protection technologies, which deliver robustness without sacrificing flexibility and low weight. 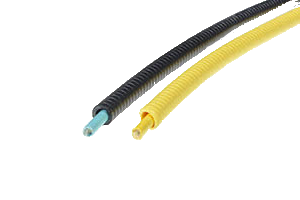 And when fiber cable is light, flexible and robust installation becomes significantly easier, no matter the application. Protecting fiber is at the heart of what PPC does. 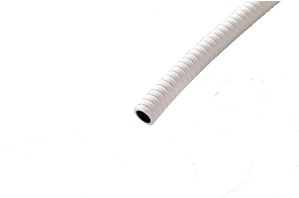 Our first development was our fiber protection tube, bend-limiting tubing to manage fiber in data centers. From there we began working with the aerospace and auto industries, protecting fiber for car and flight systems. This singular focus on enabling low-risk, low-cost fiber deployment led us to address what has become our largest market: fiber to the premises (FTTP) and fiber to the home (FTTH) installations for the telecoms industries. 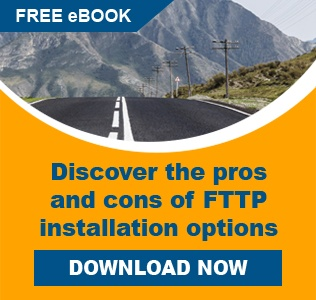 Labor typically accounts for 80 per cent of the cost of an FTTP deployment, given the highly skilled personnel and specialist equipment required when using traditional methods. In order to help reduce these costs, we invented the technology behind pushable fiber. 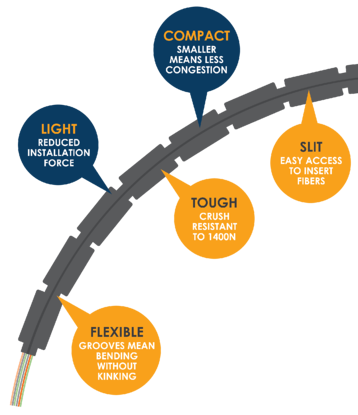 Our Miniflex™ fiber optic cable is now regarded as the premier pushable fiber product on the market. 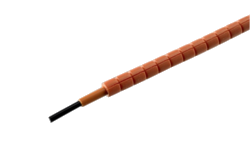 Miniflex cable is made with a rugged plastic polymer that is robust in terms of crush and tensile strength. Our patented “live hinge” grooving helps it remain incredibly flexible while resisting kinking and bunching during installation. 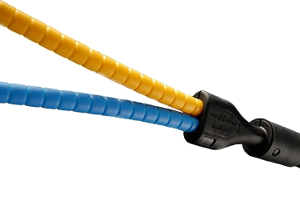 This combination allows Miniflex cable to be pushed into duct or through crowded risers with ease. We continue to innovate around our core values. We have developed a range of microducts with the lowest inner lining friction levels in the industry to make installations more efficient. The Miniflex® cable sits at the center of a newly developed MDU solution that balances cost against future deployment growth needs. 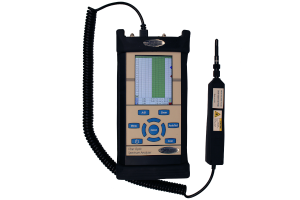 We invented a pre-terminated cable with a self-assembly SC connector (QuikPush™) to remove the need for field splicing. 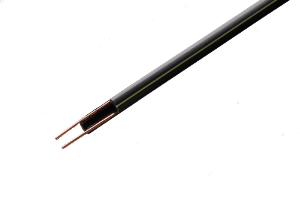 And we have designed an incredibly tough but lightweight aerial cable that is being rolled out around the world. 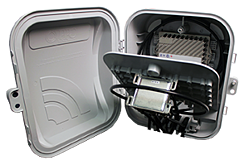 With the importance of fiber optics only continuing to grow, we are proud to be offering our clients smart fiber solutions that increase efficiency, lower costs and take risk out of installation.